Banished to the surface, Noah and his team struggle to survive in the harsh climate and forced to make a difficult decision. In their quest to see the first dawn, they make a shocking discovery about their past that could help Noah bring Mother’s cruel regime to an end. 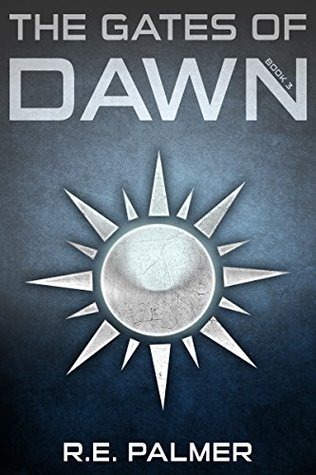 There are not enough words in the English language to describe how much I’ve enjoyed The Never Dawn series by R.E. Palmer, or this latest addition to it. These books came across my desk from a relatively unknown author—and it was by sheer whim that I decided to pick them up for review. I am so glad that I did. I adored this book. It was such a fantastic conclusion to one of the best YA Science Fiction Dystopian series I may have ever read. Though a bit darker than the two books that came before it, The Gates of Dawn by R.E. Palmer sucked me into the story right away and didn’t let up until the last page. I was saddened to put this book, and this series, down when the last sentence was read. I’ve grown to love and care for the many characters within its pages. I cheered when they triumphed, and gasped, disheartened when they were thwarted. There were many aspects of the story that surprised me and left me scrambling to read on to discover what would happen next. The ending, in particular, wasn’t one I saw coming—but at the same time, I’m not upset by it. Although it wasn’t the ending I expected or even wanted, it seemed fitting for Noah’s story. I read this book aloud with my daughter, and she fought tears the entire last chapter and epilogue of the story. It broke our hearts, and I think we both agree that this series is one of the best series we’ve read between us. If you enjoy YA Science Fiction, or Dystopias, you need to pick up this book, and this series. It is so well crafted and well voiced—trust me when I say that you will not regret it.